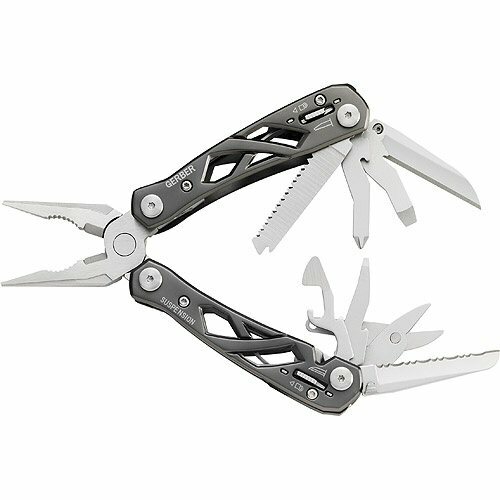 Gerber Suspension Multitool features an eye-catching, reduced weight open frame made from stainless steel. Handle finished in titanium grey finish. 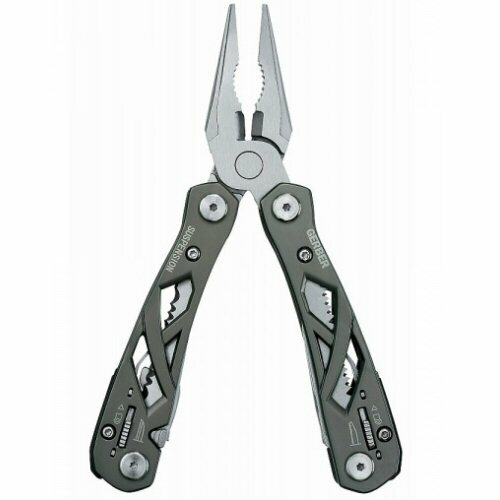 Features include Saf-T-Plu component locking system for each tool, fine edge blade, serrated blade, small screwdriver, medium screwdriver, crosshead screwdriver, spring loaded needle nose pliers, wire cutters, wire stripper, saw, can opener, bottle opener, fiskars scissors and lanyard ring. Comes with nylon sheath. Blade made in Taiwan. Length 164mm when open, or 101mm when closed. Picture showing the tools displayed.